The ideal candidate for this position is a strong writer and a process-oriented person who values relationship building. This is an excellent opportunity for an early career fundraising professional who is committed to social justice and building the power of a people of color-led organization. The candidate must be committed to the mission and values of Neighbor to Neighbor as well as best practices in donor-centric fundraising. This position is an opportunity to engage with donors, community leaders, and policy makers to help bring about real progressive change. 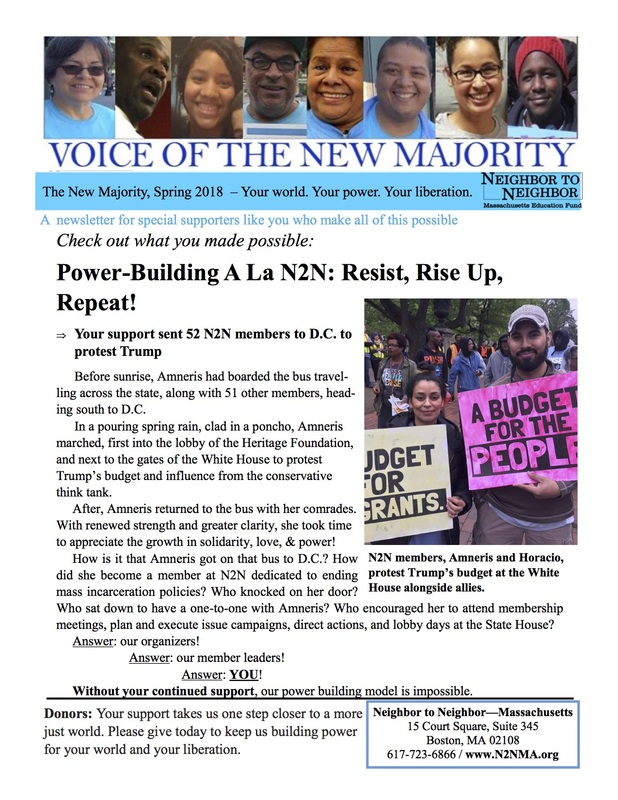 We are the “new majority:” people of color, immigrants, women, and the working class on a path to liberation. Our statewide membership organization is marching to put people and the planet before profit. We counter the fear that causes injustice by building power and transforming the institutions that govern our lives. In an era of income inequality, environmental degradation, and racism, our chapters are confronting this triple crisis in Massachusetts. We fill the ballot box with our votes. We fill the streets with our voices. We seed the new alternatives that put power and decision-making in the hands of those directly affected. We are certain that a better world is possible and we are committed to building it. Creating and implementing a development plan. For 2019, the fundraising goal is $900,000. Current activities include direct mail, events, donor meetings, development communications, grassroots fundraising, and grants proposals and reports. Serving as a member of the organization’s leadership team. Monitoring results and evaluating the effectiveness of the organization’s fund development program. A track record of deepening donor relationships and cultivating new ones. Experience managing multiple projects and ability to train and manage a cadre of staff. A passion for economic, climate, and racial justice. Salary: $60-70k DOE. Benefits include fully paid health insurance coverage for individuals and families; paid holidays, sick time, and three weeks paid vacation; Flexible Spending Account, and disability. All communities in our Commonwealth have the right to breathe deeply and live sustainably–regardless of race or income. Yet, our state legislators who serve to represent all communities, apparently disagree. In an article published in Commonwealth Magazine by one of our movement’s leaders, Khalida Smalls, wrote, “inaction has consequences”. The State legislature has fallen short in their ability to push for effective climate and environmental legislation, leaving our black and brown communities, and communities of color left out, once again, in not only clean energy legislation, but in immigrant rights legislation, and wage theft as well. All-and-all, the state legislature severely missed the mark on justice and equity legislation, and it’s becoming a trend. For instance, the Massachusetts House and Senate Conference Committee released an energy bill on July 30th at 8pm, that includes the following: boosting the Renewable Portfolio Standard (RPS) annual increase to 2 percent in 2020, but declines back to 1 percent in 2030; allows for 1,000 megawatt hours of energy storage and 1,600 megawatts of offshore wind; expanding energy efficiency offering within the MassSave program, and allowing trash and biomass to be burned to produce energy. As part of the Green Justice Coalition (GJC), we have worked tirelessly over the past two years to promote equity in our state’s energy and environmental policies. This legislative session, GJC has prioritized environmental justice and access to solar energy as critical issues facing our communities, right now. We are grateful for the two bill champions–Sen. Chang-Diaz and Sen. Eldridge, and the handful of other legislators who supported the bills to the end. Unfortunately, their support was not enough to see these bills passed. On the evening of Monday, July 30th, state legislatures showed us that our communities can continue to be sacrifice zones for pollution from landfills, gas compressor stations, pipelines, toxins in our homes, schools, and on our playgrounds. This is what environmental racism looks like – overburdening and denying benefits and protection to communities of color. These sacrifice zone for pollution exist because there’s a long history and evidence of these communities being targeted. Massachusetts despite its progressive reputation, has some of the most profound racial and class disparities with respect to the unequal exposure to environmental hazards. Our legislators had a clear opportunity to do something about that–instead, they did nothing. The Center for Effective Government in 2016 graded states based on the exposure of people of color and residents below the poverty line to hazardous facilities. Massachusetts scored on the failing end and was one of just two states with an “F” grade. Compared to white children in Massachusetts, children of color under age 12 are two and a half times more likely and low-income Latino children almost four times more likely, to live in the shadow of a hazardous chemical facility. The Solar Access Act would have been a step to helping our communities breathe clean air by encouraging developers to build solar energy in low-to-middle income communities, and environmental justice communities, and provide meaningful savings for these customers. State policy continues to deeply disadvantage these communities by offering those who already experience economic barriers a fraction of the solar compensation available to homeowners with perfect roofs. Beyond the disregard for communities of color demonstrated this past legislative session, legislatures also missed the mark to protect our communities from further pollution. We know this, because GJC worked closely with the Governor’s administration and key legislative committee leadership to introduce and move a bill that was, in fact, cautiously consistent with state policies that have been in place since 2001. This was the Environmental Justice Act. The bill was reported favorably, and without amendments, from the Environment Committee. Subsequently, the bill was also added to the Environmental Bond bill and successfully reported out of both the Environment and Bonding Committees. Yet, despite having been successfully reported three times out of Committee, without amendments or opposition from regulated industries or the Administration, the bill stagnated in Ways and Means and was ultimately killed. The only discernible opposition in the final days of the legislative session appeared to be a single legislator who objected to protecting communities of color from excessive pollution, because to do so would require the legislature to recognize racial disparities, instead of being “color-blind.” In a stark abdication of commonsense law-making, this legislature derailed an entire line of public policy development that has existed in Massachusetts since 2001. If we step out of the rarified air of Beacon Hill, we find a harsh racial reality across the state. Black, Latino, and Asian-American communities are more likely to bear the brunt of pollution and environmental injustices. The city of Springfield suffers from the highest levels of asthma, nationwide. This country, this state and this city have a history steeped in racism and discrimination, and it continues to be true today. Moving these two legislative bills could have been major stepping stones in ensuring that all communities in our Commonwealth have the right to breathe deeply and live sustainably. Join us in holding legislator’s accountable. 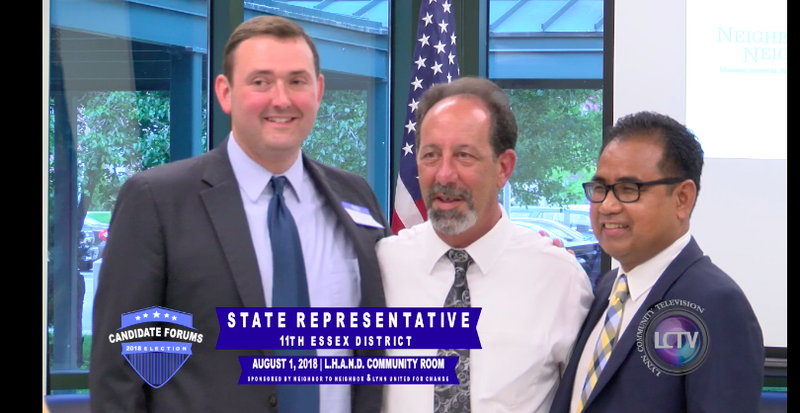 Let’s work to build even more state and local power, and show legislators that our lives and issues matter, and that we voted them into office. The State House is OUR house. Let’s work to reclaim it! The resources our donors contribute to Neighbor to Neighbor are essential to our fight for a better world, so we’re excited to create a space where we share with you the transformative work that your generosity makes possible. This is our first Donor Call & Webinar of an on-going series where we will share our work and build with you. We hope this inspires you to sustain N2N. In this webinar, our speakers offered an overview of N2N’s burgeoning environmental justice program, and shared insights from one of our local environmental justice campaigns. Our speakers also answered some great questions from those who were able to join the call. Neighbor to Neighbor is hiring a full-time Climate Justice Field Coordinator with a community organizing background to join our diverse, passionate leadership team. We are the “new majority:” people of color, immigrants, women, and the working class, on a path to liberation. Our statewide, membership organization is marching to put people and the planet before profit. We counter the fear that causes injustice by building power to transform the institutions that govern our lives. 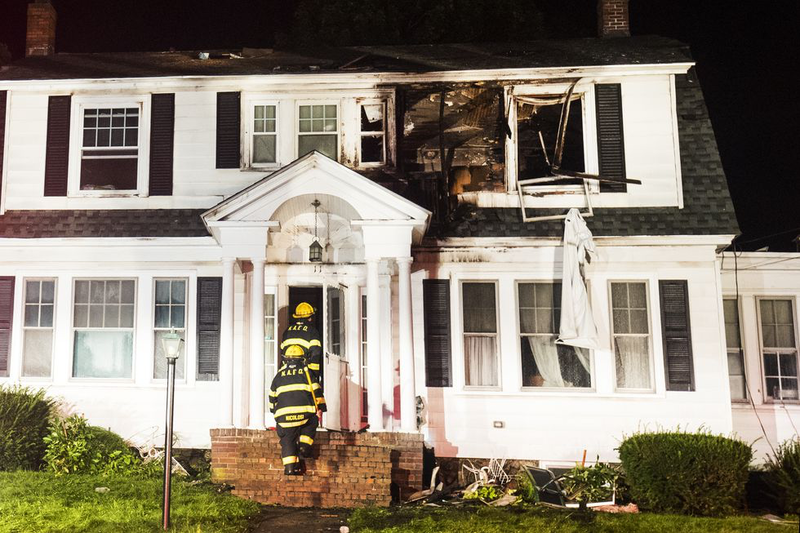 In an era of income inequality, environmental degradation, and racism, our chapters are confronting this triple crisis in Massachusetts. We are certain that a better world is possible and that we are the ones to build it. For more information, please visit www.n2nma.org and actionfund.n2nma.org. After successfully completing a campaign to shut down a coal plant in Mt. Tom, Holyoke and transitioning the site to a solar field, Neighbor to Neighbor is expanding our climate justice work. We are on the brink of developing an integrated and state-wide climate justice program into our organizing model of going broad for big sate-wide wins and deep for base building and leadership development. 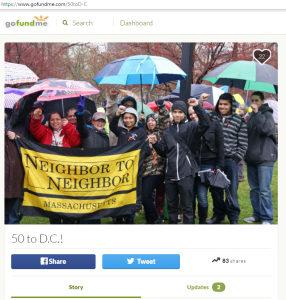 Given our membership and our track record working on economic justice, Neighbor to Neighbor is well positioned to bring to the field of climate justice an economic and racial justice lens. 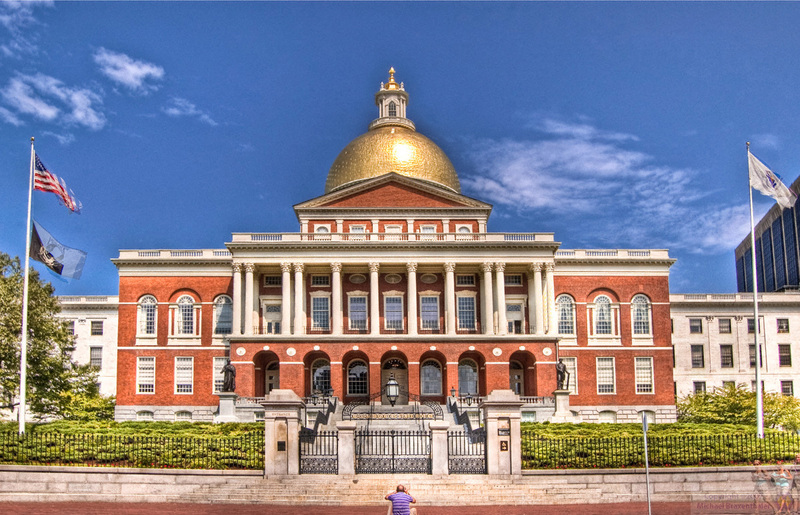 As members of the Green Justice Coalition and the Mass Power Forward Coalition, Neighbor to Neighbor currently is engaged in important legislative campaigns to advance renewable clean energy and codify environmental justice oversight into state law. 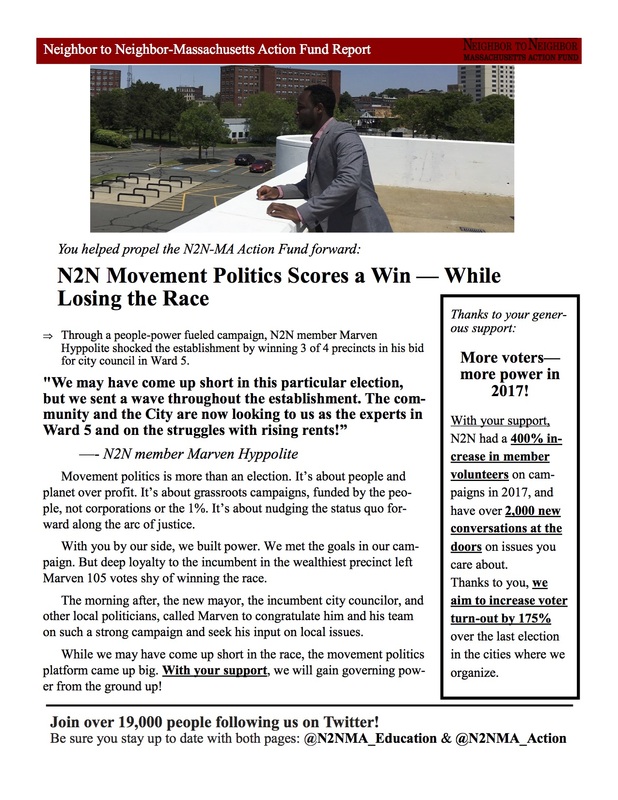 To these campaigns, we desire to add grassroots power that will lift campaign demands through organizing and mobilizing for legislative grassroots advocacy, and local events and actions. In addition, we seek to go deeper in the three communities where we organize – Lynn, Holyoke and Springfield – to conduct surveys at the doors and focus groups to learn directly from our community what their most pressing issues are, how they understand climate change, and identify local environmental threats. In partnership with the Executive Director, the Climate Justice Field Coordinator will build out Neighbor to Neighbor’s state-wide climate justice program. The vision is to establish a core group of Neighbor to Neighbor members to lead campaign planning and actions. The Climate Justice Field Coordinator will be able to travel and willing to spend at least three days/week in the field in Lynn, Holyoke and Springfield. Given that our entire organizing staff is Latino/a, our ideal candidate will have a racial justice analysis, experience working with or living in communities of color, and be ready to engage as a team player. Strategy: Work with the Executive Director to articulate and implement an annual plan with clear outcomes, objectives, activities and timeline that will guarantee the establishment of a core group of 15 – 20 member leaders at Neighbor to Neighbor committed and devoted to advancing a climate justice agenda that integrates racial and economic justice. Work with Executive Director and the organizing team in developing and implementing a community climate justice survey; analyze results and integrate them into Neighbor to Neighbor’s climate justice program. 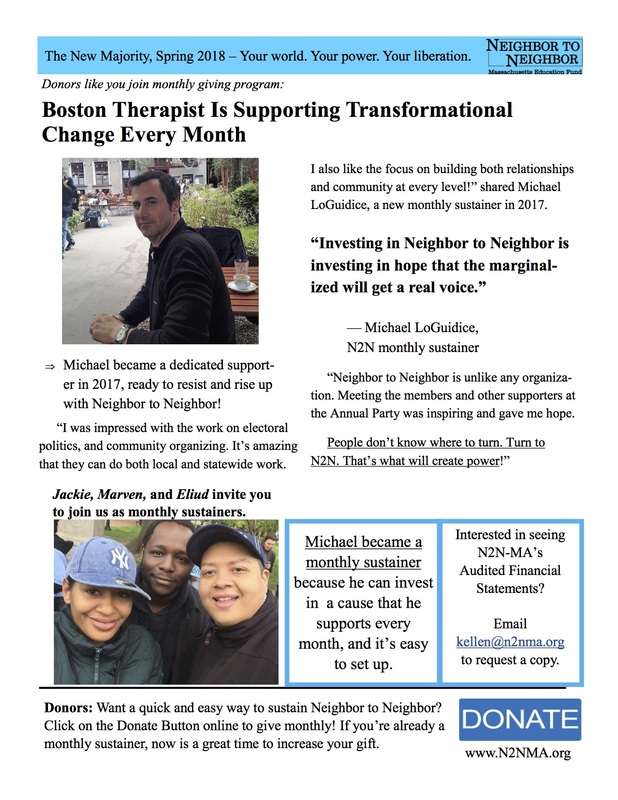 Community Organizing and Coalition Building: Develop and execute canvassing plans in targeted neighborhoods in Lynn, Holyoke and Springfield; accompany canvassers in door knocking activities; organize public events and workshops; do at least five one-on-ones a week; facilitate member meetings and trainings. Must have a Driver’s License and be able and willing to regularly travel across the state. 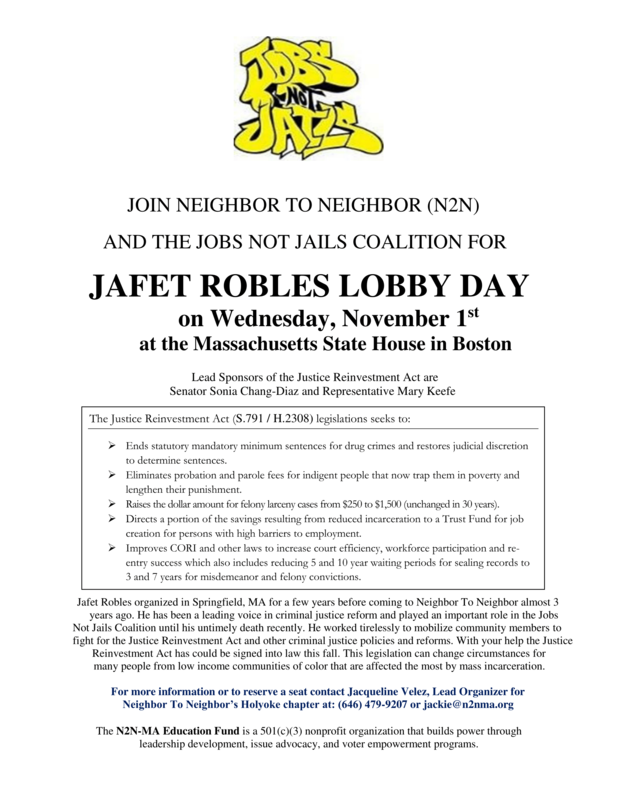 Represent Neighbor to Neighbor in the Green Justice Coalition, MA Power Forward Coalition and other state and national spaces. Management and Administration: Recruit, train and supervise a team of part-time canvassers at each chapter; keep track of progress towards program outcomes in N2N’s organizing database system; document program achievements through written reports, pictures and social media posts. Fundraising: Set an annual fundraising goal; manage individual donor portfolio of at least 30 donors for cultivation and solicitation; organize one grassroots fundraising event or house party; collaborate with Executive Director and Development Director in providing information for grant writing and reports. Community Organizing: Passion for economic, racial and environmental justice. Two or more years’ experience as a community organizer, including volunteer recruitment and supervision, canvassing, and meeting facilitation. Project Management: Experience in planning, leading, and managing organizing projects, including working with others to reach common goals and objectives. Ability to work independently and as a team player, to take initiative, and to manage multiple tasks and projects simultaneously. Strong organizational and time management skills with exceptional attention to detail. Communications: Skilled in creating powerful, compelling written and oral communications for the campaign and for fundraising. Ability to convey complex ideas through brief, simple materials. Fluent in Spanish. Relationship Building: Skilled at establishing and cultivating strong relationships with a diverse range of people, across the organization and externally. High energy and passion for Neighbor to Neighbor’s mission. Flexible and adaptable style. Compensation: Salary: $45 – 55 DOE. Benefits include fully paid health insurance coverage for individuals and families; paid holidays, sick time, and three weeks paid vacation; Flexible Spending Account, and disability. 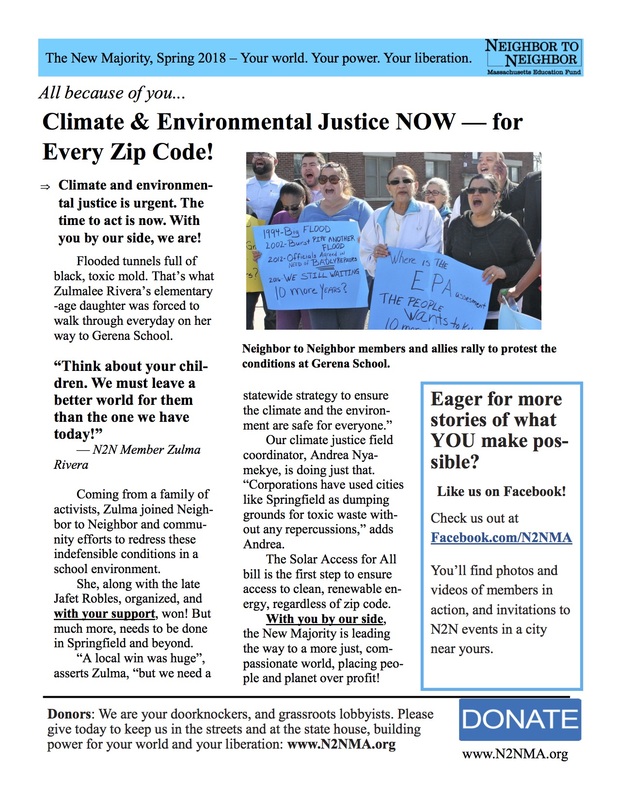 To Apply: Email resume and cover letter to elena@n2nma.org with subject Climate Justice Field Coordinator. Applications will be considered as they arrive until position is filled.